As a parent, one of your most important concerns is how to keep your child safe at all times. Sooner or later, your baby will start moving around and honestly, investing in a good helmet sooner rather than later might be a good call to make. Being a doting parent, you may already have done some research on kids bike helmets. Helmets may be looked upon as a versatile item whether your baby has started crawling or even if you decide to take your cutie along for a nice bike ride. For parents with older kids, helmets are of utmost importance so that your kids can actively take an interest in fun activities such as bike riding, skating, and so much more while staying safe and also stylish. Here are our top 8 picks for kids helmets. The name says it all! Here is one of the best choices for purchasing an infant bike helmet. Made with industry grade Microshell and PVC, the inner material is made with EPS and interchangeable foam pads complete these trendy looking helmets. Available in a wide range of colors and prints, these helmets also come with cooling vents. 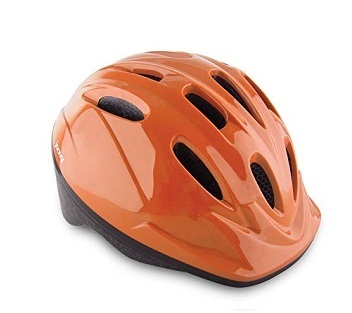 The design of the helmet includes a soft strap that is extremely skin-friendly. The buckle is curved to facilitate smooth, no-chin-pinch wear. Moreover, the progressive design allows for full protection of the skull with extended back coverage. The product is light in weight, comfortable to wear, very reliable to use and can fit different head sizes. You will also get great value for your money as you sit back and watch your child enjoy some exciting outdoor activities. As mentioned, the inner padding is washable and so is the outer shell. A reliable choice for kids. A cost-effective option for a wide range of head sizes. Cooling vents that will keep your child’s head dry. Tends to be a bit bulky after long hours of wear. May turn out to be loose for tiny heads. You will love this product for how trendy it makes your child look while keeping her/him safe. The colors are attractive enough, and the design is adorable. This will make even the fussiest of kids want to wear them. The affordability is indeed a bonus. The joy of parenthood brings across a number of challenges. Falls and crashes seem to be any child’s second nature, whether they are playing on their own or out and about with other kids. Nevertheless, our next pick promises to protect your kid’s head better than other kids’ helmets available in the market today. The Nutcase brand allows you to choose from a wide range of helmets. Size ranges are available for 12-month-old babies to bike helmets for 3-year-olds. Nutcase also makes adult helmets. With Nutcase, you can find both sober and bright-colored helmets that are lightweight and have several cooling vents that will keep your little one happy for the ride. Another wonderful feature of this product is the closure powered by a magnet called a Fidlock that makes the helmet easy to operate. Soft EPS foam keeps the little head snug as well as protected. The one feature however that makes Nutcase stand out is, however, the very shape of the helmet. 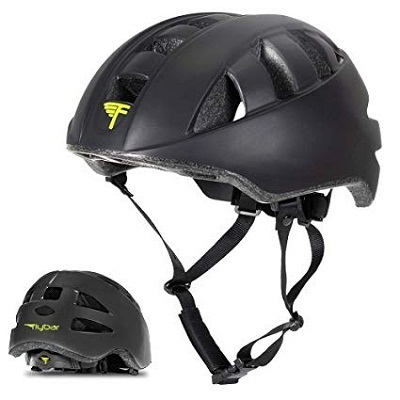 Designed specifically to facilitate good posture for riders across all ages, these helmets also come with additional pads that can be adjusted according to the size of the head as well as growing circumference. Extremely light to the head. Easy to buckle and unbuckle. Stylish and encourages good posture while riding. Can be adjusted according to the circumference of the head by choosing the correct thickness pads. May seem really big for heads with a small circumference. The magnetic closure may be fiddled around with if careless. Cool, intelligent helmets that encourage your kid to sit correctly while riding. Around 11 cooling vents that can keep your littler rider going for long distances. Above all, a helmet that truly grows with your growing child’s head. During playtime, while fun is every kid’s concern, safety is every parent’s concern. However, when did that mean that you cannot make your kids look gorgeous while being safe and cool! 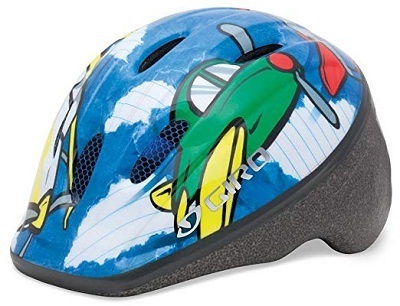 Giro presents our next choice for kids’ helmets. The Giro helmets are well-known for creating the best toddler bike helmet. The very first thing that will attract you is a splash of colors that will interest your child while checking out the helmets. Designs include animated pigs, geese, ducks, chicks, and others. On the safety-features side, Giro helmets weight light and come with a fit system called Mini-Loc. The one feature however that defines this product is the addition of a built-in visor. Bike-riding during the summer is an activity that interests kids and adults alike. This visor provides nice shade for your child’s eyes while riding around in the summer. Another wonderful addition to this range of helmets is the bug net. Multiple cooling vents make it a very popular choice among parents. This particular range caters to heads having circumference between 18.75 – 20.5 inches. Constructed with Microshell making it sturdy and reliable. Inbuilt visor and bug net. Stays in place once buckled. The soft Velcro strap is very kid skin friendly. May show tears after considerable use. Extreme heat may melt the shell. This bike helmet has a dual function that protects your child’s head as well as the forehead and eyes with the in-built visor. The neat design enables you to fit your child even on a high chair while going outdoors. Joovy has designed its range of Noodle helmets exclusively for the cutest members of the society. Joovy Noodle Helmets comes in small and medium sizes catering to head circumference ranging from 18.5 to 22 inches. 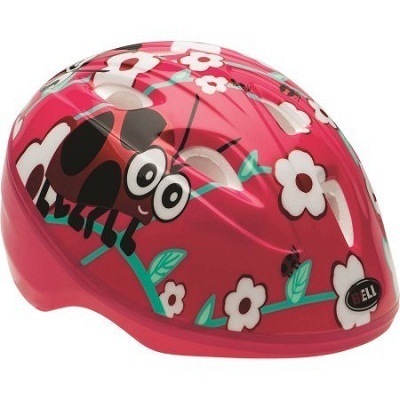 These trendy, lightweight helmets are perfect for children of ages between 1 to 9 years of age. Created in 8 shades, this helmet is a lovely choice for a bike helmet for 2-year-old as a gift. These helmets are incredibly designed to keep your child’s head cool with around 14 cooling vents. An elongated visor provides complete protection to the head, forehead and eyes while riding. The helmet comes with nylon straps and a fit dial that can be adjusted according to your kid’s head. This CPSC stamped helmet also comes with a user-friendly strap and buckle that will not pinch the baby skin chin. The sleek helmets are however made for tough use and are very durable. The shape of the helmet provides full coverage for the rider’s head. A solid well-designed option that you can rely on. The integrated visor that gives optimum sun protection. Good ventilation to keep cute heads cool. Maximum coverage and good padding for best results. Very specific head size required in order to make the correct purchase. To be cleaned carefully for durability. The fit dial will help you adjust your child’s helmet accordingly. This is one of those precious helmets that are not only made with the highest quality materials but is equally affordable. The front vents built with bug mesh is an added plus. What makes this choice unique is the cute aqua designs that are imprinted on the hard-shelled outer cover. The cover has animated octopus and shark motifs which is why your child will absolutely adore this helmet. As a parent, of course, there are other reasons why you will want to invest in a FunWave helmet. Let’s start with the CPSC standard that these helmets meet, making it a very competitive choice. Easy adjusting horizontal and vertical straps make this helmet stay at one place and not slide off. Padded inserts are included in the package making it suitable for kids of a large range. The fit dial, EPS and multiple cooling vents just make this a sought-after product. Tough exterior and soft padding to make it durable. Comes with a user-friendly release clip. Soft straps that will keep the helmet in place but not brand your child’s skin. Does not cater to children more than 7 years of age. This helmet protects well, is lightweight and more importantly is cost effective. The product is durable, easy to clean and hassle-free to maintain. While you as a parent find it a duty to purchase the best baby bike helmets for your child’s protection, your child may have some other ideas. Kids prefer colorful, attractive helmets and may not cooperate with you if you have already tried to make your kid wear a sturdy, but a less interesting-looking helmet. Raskullz took this point seriously and created innovatively-designed helmets that are colorful and shaped like a unicorn! Available in various colors (usually dual), these helmets meet the ASTM and the CPSC standards. The straps are made of nylon and easy to use without the fear of skin abrasion. The helmet comes with ample cooling vents and aerodynamic design for good velocity. 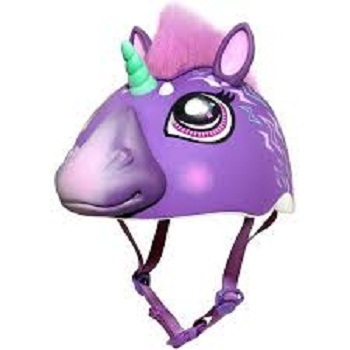 A multi-dimensional unicorn-shaped helmet that will make your kid love this helmet. Good EPS shell that absorbs shock. Fit may be a tad problematic. Does not come in varying sizes. Though fancy, this helmet is a proven choice for the toughest of riders. The helmet is extremely sturdy and very durable, meaning that you can use it for more than one child. The one word that will sell the idea of a helmet for your little kid’s head is ‘superhero’. Wonderful 3D designs, good shock absorbers and affordable prices will make this a good choice that will satisfy parents. It has multiple cooling vents, with an integrated bug mesh in the front vents. Spiderman , Captain America, Iron Man superhero themed helmets are just a few of the offerings that Bell brings you from the Marvel universe. Superhero themed helmets that the kid will love. Adjustable strap and user-friendly clip on. Cooling vents with bug mesh. Tough outer shell and nice inner foam that keeps the helmet in place. 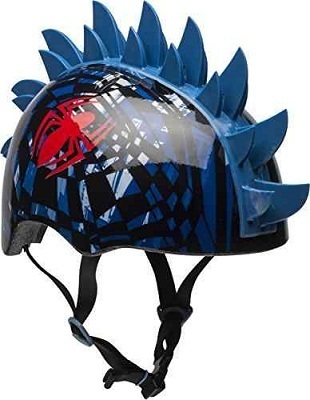 You will like this product because your kid will adore the superhero-themed helmet. This product is also lightweight, durable, and provides complete protection for your child’s head. While most helmets cater to biking and basic riding, here is a wonderful choice that caters to several interests that your kid might develop. 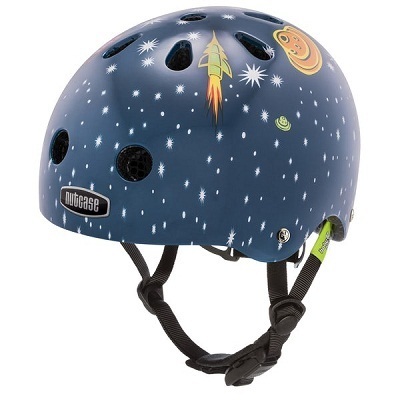 These Flybar helmets have been created for kids of all ages and sizes who want to ride bikes, roller blade or skate. These helmets come in 7 colors and in 3 different sizes that help choose one according to your kid’s age, interest, and head circumference. These helmets can be used for multiple sports. EPS foam lining for the soft inside. Outer shell made with ABS and matte finish. May not fit huge heads. Extreme conditions can break the helmet. You will love this product for the protection it provides for the various activities your child may be into. Another advantage of choosing this product is the large sizes can also fit adult heads. Helmets are required for the safety of your child during biking and other sports activities. Children will be more inclined to wear a helmet if it is both safe and also attractive to them. These cool and fun choices of helmets we have listed are the best picks to keep your child protected. Also, helmets make an adorable present regardless of the occasion. So choose wisely and invest in one of these top bike helmets for kids!